Bali Rafting + Elephant Ride + Tanah Lot Tour is an incredible Bali rafting tour package where you will join in whitewater rafting on the Ayung River, with beautiful views and lots of fun, combine the elephant ride of 30 minutes at the Bali Elephant Camp with the view of the valley of the Ayung river and see the wild animals as birds or monkeys. It will combine with a visit to the forest of Sangeh Monkey and will end at the Tanah Lot Sea Temple to enjoy the wonderful sunset. 14.30 – Visit Bali Elephant Camp for join on 30 minutes elephant ride. 15.30 – Visit Sangeh Monkey Forest. Your Ayung rafting tour begins with morning pickup by our friendly driver with private air-conditioned vehicle from your Bali hotel and drive through the countryside and arrive at Payangan village, Ubud Bali, Gianyar. 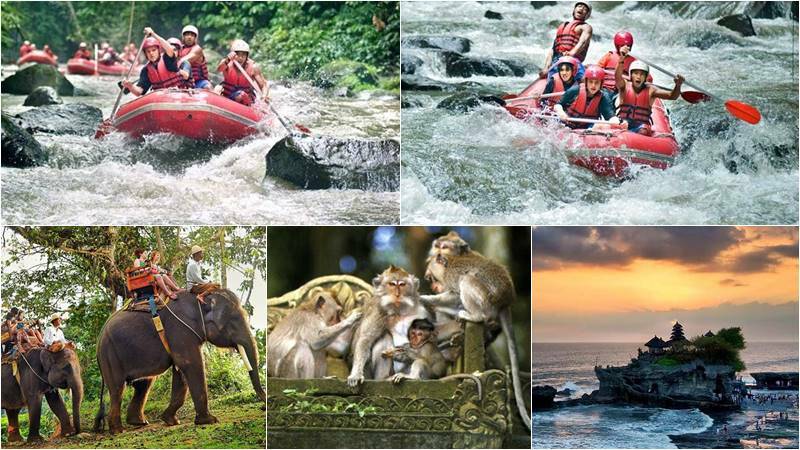 After all participants have rafting equipment including lifejacket and helmet, it is time for you to experience a truly unique and unforgettable epic journey thru winding gorge, luscious jungles, and wild life in its natural homes. Paddle through astonishing waterfalls for unparalleled river fun. Our trained professional river guide with internationally accepted equipment will guide you through about 12 km of exciting grades II and III rafting. Follow his instructions and paddle along the way, laughing, shouting and having an unbelievable adventure. Your safety is our highest priority always on this 2 hours of fun Ayung rafting trip. After your shower and change, the Indonesian Buffet Lunch is served to you while you enjoy views from the stunning restaurant and relax in a peaceful atmosphere of Bali. Experience 30 MINUTES of Elephant Short Ride, pass through the tropical plantation of durian, mango, jackfruit, coconut and bamboo. You can also see the tropical bird in its natural habitat. Look at the rushing water of the Ayung River and discover how fun Elephant can be riding. Our elephant will show their pool while wading through the water to refresh themselves from sunlight. It is a small fertile monkey forest that the group of monkeys dwells in. It is located in the countryside of Sangeh, north of Denpasar town, Badung Regency. It is one of Bali’s strategically located tourist destinations next to the road. To reach this place, the good road has been provided and many tourists have come to this place to see the cute monkeys. Visitors can bring a bunch of bananas, peanuts to feed them. In the midst of the ocean stands this Balinese Hindu temple within the strong rocky land. Within the specific time of sundown, this temple could be very lovely. We are able to see this temple with a spectacular view of the ocean and the sundown, from several spots. When the water goes tide we find a drift in the temple, because the sea waters surround this temple. During the low tide, the snake, who believe as the guardian of the Temple, could be seen by the visitor too. Ticket for 30 minutes elephant ride at Bali Elephant Camp.